Smell any onions on your hikes lately? It's a perfect time to find these tiny, wild delicacies. And like their cultivated cousins, all parts of the plant can be eaten - even the purplish bulbils on the top! But always be sure they smell like onions before consuming since there are poisonous look-alikes such as the rain lily and crow poison. Eat the bulbs, bulbils, leaves, flowers and stem-like scapes raw or cooked but always make sure they smell like onions before harvesting! Foragers should remember that seeing is not the only way to identify a plant. Our noses are tremendously helpful when trying to locate, identify and understand a plant. A true wild onion will always smell distinctly onion-y. That onion smell, wafting up to greet your nose, might be the first hint that wild alliums are underfoot when you’re walking in the woods or along a creek. Little tear-drop shaped bulbils, often tinted purple or pearl-white, growing like a flower on top of some species may also give you a hint that you’ve stumbled upon a wild onion patch. 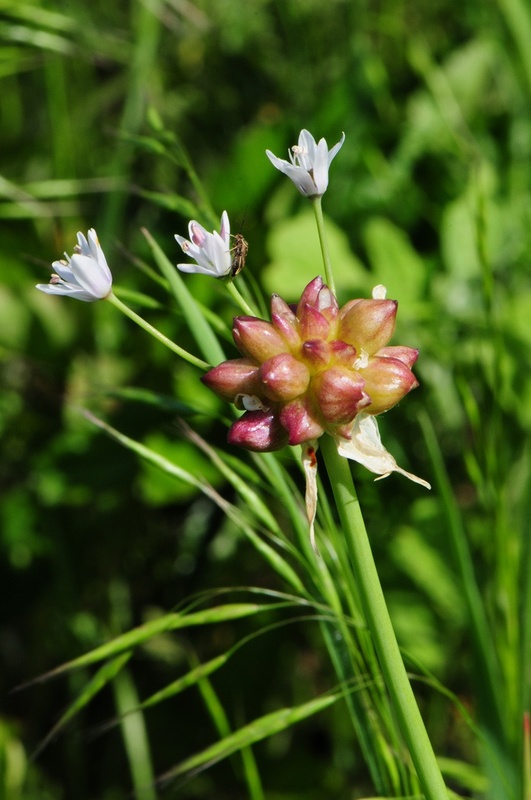 Don’t trust your eyes when foraging for wild onions since there are a few wild plants that look the same. Smell first, and then taste. If your mouth fills with that familiar, sharp and pungent onion-taste while munching on a little bit of leaf or a bulb, you’ll know for sure you’ve found a fabulous, fresh patch of wild onion. Wild onions and garlic grow in every part of Texas, though a more diverse selection of species can be found in the eastern two-thirds of the state. The perennial allium has flat or semi-hollow leaves that can grow 12 inches or taller from a bulb just beneath the soil surface. A single flowering stalk or scape rises from the center and usually bears white, purple or pink flowers. All parts of the plant are edible and can be used as you would any cultivated onion or garlic. The difference between cultivated garlic and onions is distinct. In the wild, it’s not so easy to distinguish. Even botanists have a hard time classifying what is an onion and what is garlic. Taste will possibly help you, but be assured that wild onions and wild garlic are all perfectly edible and tasty on any table. Wild allium bulbs and bulbils can be stored fresh for several days to weeks in the refrigerator though the greens will only store for a day or two and should be used fresh. Wild onions do not usually store well like some cultivated onions. However, they do keep underground so remember where the patch is and long after the green leaves have died back, you can still dig up wild onion bulbs. But be sure to leave some to multiply and reproduce for years to come. Egg custards are wonderfully forgiving and versatile, allowing you to mix and match ingredients. If you can’t find wild spinach or dock for this recipe, feel free to substitute other wild greens such as amaranth or violet leaves. Preheat the over to 350º. To prepare the pastry, sift flour, Parmesan, salt and black pepper together in bowl. Cut-in the cold butter with a pastry cutter or mixer until the mixture is crumbly. Add ice water, one tablespoon at a time, until the dough sticks together in a ball. Hand-press the dough into a 9 or 10 inch tart pan. To prepare the filling, sauté the wild onions and spinach in olive oil for a few minutes, just until the greens are wilted. Spread the goat cheese on the bottom of the tart shell, then sprinkle the other cheeses on top. Layer the sliced tomatoes and onion/greens mixture on top of the cheeses. Whisk together the eggs, cream and salt and pour over the top. Bake for 30-40 minutes.